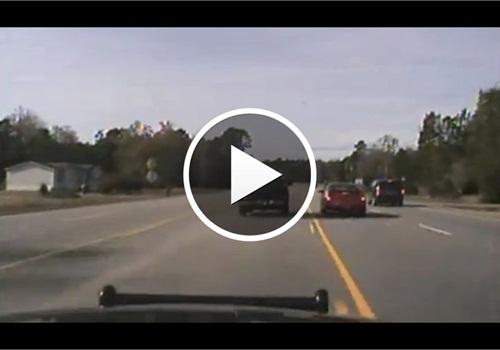 Surfside Beach (S.C.) Police released a dash camera video recorded of a chase in which police said a man and woman were charged in connection with a stolen cellphone. The video showed a dark in color sport utility vehicle traveling along Holmestown Road before the driver spins around at S.C. 707 and continues on after avoiding hitting a vehicle. The pursuit continued along S.C. 707 until the driver turned into Tern Hall subdivision and he continues to try to elude police in the vehicle until the road ends in the Osprey Cove subdivision. The male driver then jumps out of the vehicle while it is moving and runs into a wooded area. Police said Joshua Maurice Redmond, 21, was the driver of that vehicle. Redmond and Amanda Michelle Lankford, 20, were charged with criminal conspiracy in connection with the chase on Dec. 5 in Surfside Beach following a report of a stolen cellphone in that town, police said. Read the full Myrtle Beach Sun News story.